Harness the unstoppable force and life-giving power of the natural world! 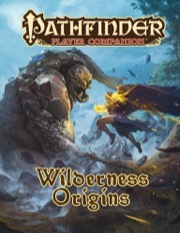 Pathfinder Player Companion: Wilderness Origins provides new options for those who peacefully coexist with their environments. Learn the magical secrets of the wilderness, tame fierce allies, and channel the awesome destructive power of nature and the elements, from the deadly rush of a flash flood to the inferno of a forest fire! Options for the shifter class, including new animal aspects, feats to augment the shifter's animal forms, and archetypes that channel the fury of dragons or the power of fey! Racial traits, feats, and archetypes for the vine leshy, gathlain, and ghoran that allow them to further leverage their inherent connection to the verdant power of nature! New player options for characters who draw their inspiration from nature, from witches who draw on the magic of wildflowers to summoners and spiritualists who bargain with kami! The dragon shifter archetype could have been better(No Form of the Dragon III? ), in fact I still don't understand why they didn't take away any of the nature themed abilities for more dragon related options. Also it would have been nice for the dragon and fey archetypes to use charisma instead of wisdom for AC or at least get a feat for it. Other then that the book has a lot of great options like alternate natural attacks for the shifter, animal companion archetypes, kineticist wild talents, flower power, etc..
Let's get it out of the way. The Dragonblood Shifter archetype is bad. (To be more specific, introduces a large gap in your advancement, and fails to live up to builds trying to accomplish similar things.) Just set that aside. The Feyform Shifter more than makes up for it, though. Minor Aspect becomes a central combat ability now, and you now consistently get something before the Druid does, all while keeping weak versions of the basic class's abilities. Furthermore, Shifter gets a bunch of content for the base class. New aspects, some interesting feats (finally combine major forms! ), and free alternatives to claws better in keeping with different aspects. New animal companion and familiar archetypes (one of the coolest parts- all three familiar archetypes are ones I'll strongly consider every time), plus a feat for a speaking familiar, or a shapeshifting familiar! Cool Oracle curses, new racial options, a trait to eat raw meat, and at least one hex that is probably a little too good for a basic hex. Also impressive is the quality of the feats. It's a really good ratio of things I'll seriously consider on characters, rather than just a few gems. Announced for January! Image and description are provisional and subject to change prior to release. Well i am looking forward to this. guess i will have to wait a year. Cool! Can't wait to see what all Shifter and Barbarians and Rangers get! I know it's a ways off, but I'm excited for folks to see what the team's come up with! Suh-WEEET! Definitely something to look forward to...but not interested in fastforwarding to it. It will be here before we know it. Looks like fun. Especially since it will give the Shifter some love! I really enjoyed Ultimate Wilderness. Will be nice to see support for it. if this would be intresting i hope this time shifter will be good. Please tell me this book will involve changes to the Shifter that will make it playable and on par with the other classes? Never gonna have errata in a player companion book. I am going to assume that the new shifter options will be archetypes. The FAQ for Ultimate Wilderness, on this very website, has those changes. yeah when will they update the PDF with those? when they do the pocketbook version? 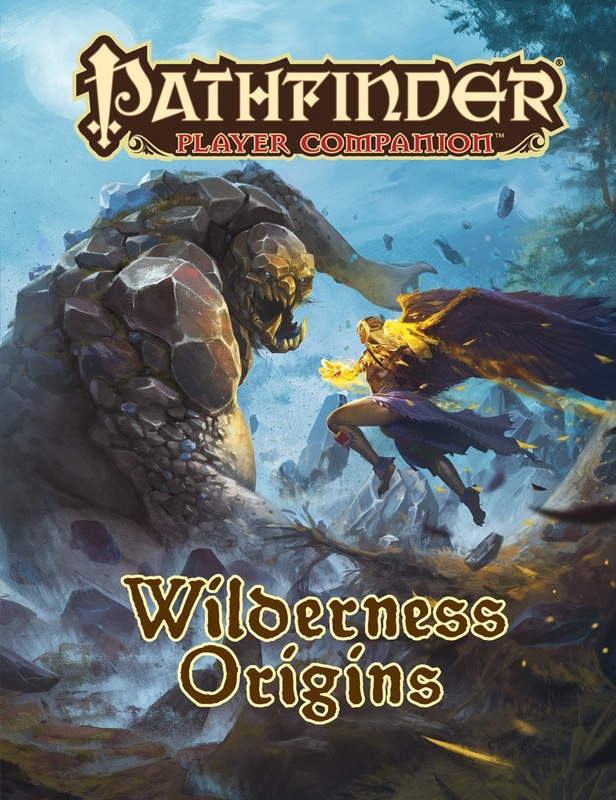 Most likely NEVER, as Ultimate Wilderness is the penultimate hardcover for Pathfinder (1st edition) and come august 2019 there will not be any new material published for it. Also the pocket editions are always identical to the current printing and UW won't get a 2nd printing. "new rules and options for the new player races"
I'll admit that I'm very curious about these new player races. Part of thinks this is an exaggeration and it's just more alternate traits to make them look new, but I'd love to be proven wrong. You can never have too many race options. And just to be part of this little quarrel, 5e has dominated our book stores and has for about a year now. We went from one table of Adventurer's League and six tables of PFS, to one table of PFS and five tables of 5e home games. I'd say a third of the store's shelves are just 5e books and Pathfinder has one individual book case with dust collecting on it. And we're just a small town. *shrugs* People like what they like. I did my part to recruit, but things just worked out like they did. I would assume the "new player races" are ones that were introduced in other books but you never know. The full text of that phrase is "for the new player races and shifter base class from Pathfinder RPG Ultimate Wilderness", so the races in question would be gathlains, ghorans, and vine leshies. David is correct. There are no wholly new races in this book. Fair enough. I have an honest to goodness reading interpretation disability so I didn't read that as one thing, but two separate. Good to know. Little bit disappointed because I love seeing new races, but that's fine. All I know is I'm interested by the shifter options and of course race options for those from Ultimate Wilderness. I am more interested in Ranger and Druid options which I can probably safely assume this will include. I am waiting with baited breath for the UW paperback edition to come out as I love the hardcover and often refer to it or the pdf for campaign ideas. I am another that is of the opinion that UW was the best hard cover Paizo produced for PF1. I am going to keep an eye on when this releases as well as the soft cover of Ultimate Intrigue as I enjoyed that book quite bit as well. Nice updates! I too like the cover art, but now I'm even more interested in Dragon shifter. :) Plus stuff about Kamis is always cool. Dragon and Fey archetypes for the shifter are certainly interesting....I'm still hesitant about shifter stuff....but this looks like it may be worth a peek. It makes me sad that the Lashunta haven't gotten any race/character options for Pathfinder since Starfinder came out. Any chance the Skinwalker or Rougarou gets any love in this one? Sooooo excited for the Shifter love and what the Witch, Summoner and Spiritualists will get...January?! Aw, nuts. I take it this is the final Player Companion for PF1? At least two more PF1 Player Companion volumes (Heroes of Golarion and Chronicles of Legends) have been announced for this line after this one. I have no idea whether there will be yet one more after the known volumes in July, but that would be the last possible time for additional PF1 material from Paizo before the edition transition at GenCon. As much as I really am happy to see dragon and fey shifter options, it is how good could they be when the base class still feels like an unfinished product. Kami based summoner and spiritualist options sound really cool. Would love to see oni themed spiritualist options. Are there any kineticist wild talents? Are there any sorcerer/bloodrager bloodlines, oracle mysteries, and/or psychic disciplines? Nature/wilderness themed archetypes for alchemists, brawlers, mediums, mesmerists, monks, rogues, and/or swashbucklers would be cool. Cavalier archetypes that grant unusual mounts like plant creatures, giant vermin, etc. would be interesting. That's good to hear. We really need a proper Gunslingers Handbook! I wonder if the new shifter archetypes will interact with the FAQ/errata changes to the shifter, or if they will simply use the class as printed to avoid confusion for those that have not see the changes. Ultimate Wilderness got its last FAQ on February 13th, so they have had sufficient time to adjust the Shifter archetypes in Wilderness Origins appropriately. Great to see more support for the Shifter before the PF1 line ends. Thank you Paizo! I hope there are some more reactive forms for the adaptive shifter archetype. I really like the direction they went with that archetype. I wish there was a archetype for the adaptive shifter archetype that would loose wild shape for at will/always active adaptations:) More adaptations would be awesome as well. It takes so much time, though, to get PFS approval. I don't play PFS but our group will be starting a new rule where you can only use material that was published during (and before of course) the time of the current AP we are playing.